A nearly decimated plant that once grew wild over acres and acres of land is reclaiming some territory. Hemp is growing wild once again in Pennsylvania. A nearly decimated plant that once grew wild over acres and acres of land is reclaiming some territory. As cannabis legalization sweeps the nation, hemp is not being forgotten. Hemp might not get you high, but the industrial benefits are endless and come at a fraction of the cost of current resources. Pennsylvania is making it their mission to help the hemp plant flourish, by dedicating a protected area to the species, while researching its many uses. If you’ve ever driven through rural Pennsylvania, you’ve noticed the rolling green meadows that extend for miles and miles in every direction. What was once covered by thick forests, Pennsylvania literally means “Penn’s Woods,” has since been cleared to provide room for cultivation. When settlers initially planted resources, hemp was among the most important and valuable crops. As reefer madness set in and cannabis was sent out, hemp, along with its many, many industrial benefits, was thrown out, too. Despite the fact that hemp contains less than .3% THC and has no psychoactive properties, the Drug Enforcement Agency has it listed alongside traditional cannabis as a Schedule One drug. Hemp can be used to create fabrics, cords, sustainable oil, CBD compounds, food, and even building materials. The list of uses extends as far as the fields in which it grew. Pennsylvania has begun reintroducing hemp to its natural habitat. This year, the state designated 14 plots of land and supplied farmers with the necessary tools to cultivate a successful hemp crop. The seeds, imported from Canada, were held up by the DEA and delayed planting. Despite their efforts, the plants are flourishing. Russell Redding, Pennsylvania’s secretary of agriculture, says the plants grew much more quickly than anticipated, but with one small problem. We had some projects that really did everything right, but were completely overrun by weeds. You’d have fields that were beautifully green, but overwhelmed by unwanted species. Trial and error is the strategy of this experiment. Hemp has always existed in Pennsylvania, it’s not a question of if it can grow, it’s figuring out the best way to create the best product. Redding says while the plants are showing tremendous growth, the project is about gaining the necessary experience to bring back an important resource. Everyone was blown away by how vigorous the plant is. It was the ugliest field of cannabis you ever saw, full of seeds and inconsistent growth, but in two months, we had 14 feet. It was heavy. We’re hoping to build on that and grow a cash crop next year. 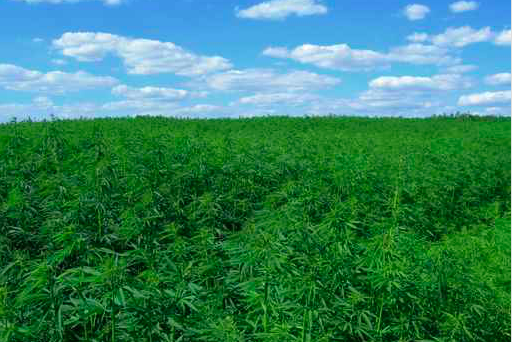 As researchers prepare for their next season of growing, it’s likely Pennsylvania will continue to develop more land into hemp fields. In addition to becoming a major cash crop, hemp helps to clean and rejuvenate the soil, a necessity for the wide range of crops cultivated in the state. For Pennsylvania, it looks like hemp might have found a home.